It’s currently day four of being back at work as a high school counselor after three months of maternity leave, and I am keenly aware of just how little time exists in each day. Time and sleep (and coffee) are the hottest commodities in my world right now. By the time I get home each afternoon, my husband and I have just a few precious hours left to spend with our two children, cook dinner, clean up from dinner and get these kids ready for bed. Our time is more precious than ever. One of the best parts of maternity leave was having time in the day to cook dinner and enjoy it with our family. But now? Dinner takes on a much more harried tenor, and so I have developed a few tricks for the dinnertime rush. One of our favorite quick meals is what we call “Mediterranean Night,” which includes some Israeli salad, humus, tahini, sliced hard-boiled eggs and the main event: vegetable bourekas. The best part of bourekas, aside from being doughy little pockets of heaven, is that I use them as a way to clean out my fridge of the veggies and/or herbs that are nearing the end of their freshness. I’ve included my favorite veggie/cheese combination for this recipe but truly, the combinations are endless. Simply chop up your favorite veggies that are lying around in your fridge, saute with some olive oil and garlic and then pair them with your favorite cheese. Add them into some store-bought puffed pastry, and you’ve got an awesome weeknight dinner in just 30 minutes. Prepare your preferred filling — for the filling featured: (1) Slice one eggplant into 1/4 inch rounds. Place rounds on a paper towel and dust them with kosher salt and let sit for at least 30 minutes. The kosher salt is drawing out moisture from the eggplant so that it will be more crispy was baked or fried. After 30 minutes, pat dry and cut into cubes. Fill a frying pan with 1 inch sunflower or canola oil and set on stove top burner at medium high heat. Once oil is hot, add the eggplant and fry until each side is golden brown. Let fried eggplant cool on a paper-towel lined plate and set aside. While the eggplant is cooling, wipe out your frying pan from excess oil and add another 2 tbsp of oil to the pan. Once, hot, add chopped leeks and garlic saute on medium high heat until fragrant (about 5 minutes). Add mixture to plate of cooling eggplant. Place eggplant, leeks, cilantro, feta, garlic, salt and pepper in a medium sized bowl and stir to combine. Reserve mixture. On a lightly floured surface, unfold one of your puff pastry sheets. Use a rolling pin to roll out the sheet to a 12×12 inch square. Cut the sheet of puff pastry dough into 9 equal-sized squares, each about 4×4 inches large (DO NOT WORRY if your squares are not exact. As you can see from the pictures, mine are not). Place 1 tablespoon of filling in the center of each dough square. Fold the dough squares by grasping one corner and folding it over to the opposite corner to make triangles. Pinch firmly along the outer open edge of the triangles to seal. Go over each edge with a finger dip of water to help seal the dough. Spray your baking sheets with nonstick cooking spray or line with parchment paper. 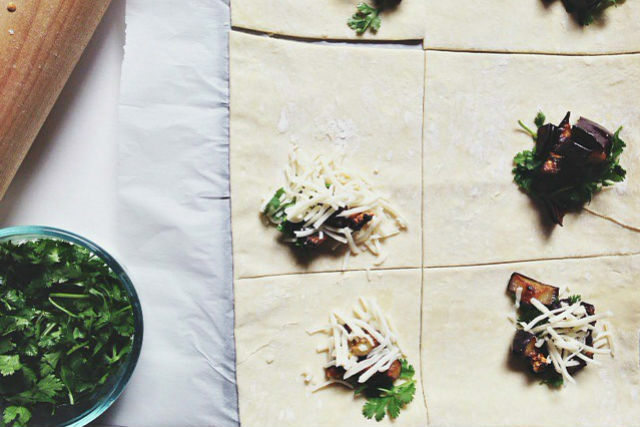 Place your burekas on each sheet, evenly spaced, giving them some room to expand during baking. In a small bowl, whisk together the egg yolk and 2 tsp of cool water. Use a pastry brush to brush a light layer of the egg wash onto the surface of each bureka. 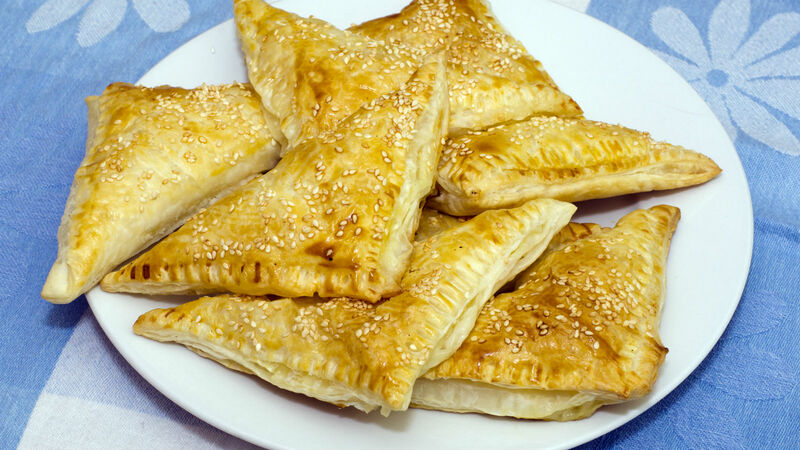 Sprinkle each bureka with sesame seeds if desired. Bake the burekas for about 30 minutes until golden brown and cooked through. An American-style pasta dish gets a Middle Eastern makeover.